Chipping is a bit like putting - it's built around feel and confidence - and if you can find a method that works for you, you should stick with it, no matter how strange it may seem. Still, there are a few undeniable laws of the short game, and one of them is to grip down on the club. Once I'm within about 50 metres of the hole, I start choking down on my grip - the shorter the shot I'm facing, the shorter the grip I take - sometimes right down to the metal - and for two reasons. First, it improves touch. By gripping down on the club you put your hands closer to the clubhead and the ball, and that enhances your feel for the shot - it's almost as if you're tossing the ball. 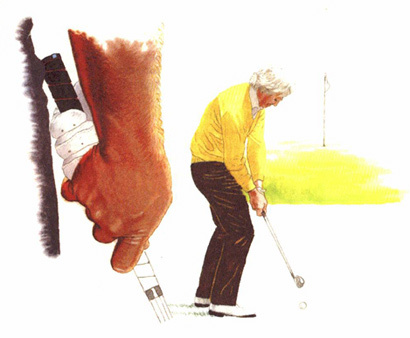 Second, by shortening the distance between your hands and the clubhead, you curtail the arc of the swing. This automatically shortens the shot without you having to make big adjustments in your swing length or pace. You can make a crisp, authoritative swing without worrying about hitting the ball well past the pin.